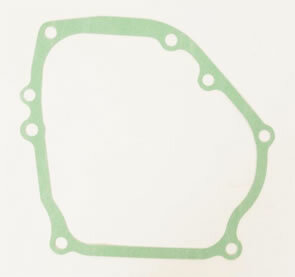 Genuine Honda Side Case Gasket. Every good engine builder will replace all the gaskets on an engine as a matter of course. Some people however do not think that there is any performance advantage in doing this and will therefore re-use gaskets until they are worn and need replaced. The side case gasket is often one of these gaskets that is overlooked and re-used. However this operation can actually be sapping power from your engine. Dyno tests have shown that by doubling up the side gasket this can relieve the side pressure on the Crankshaft and Camshaft and improve engine performance due to a reduction in friction. It can also slightly alter the cam timing as the cam is able to move along the drive train. Running two Side Case Gaskets is not legal however, so in order to relieve the side load on the engine running a fresh Side Case Gasket is the only option. Running an old gasket that has already been compressed will increase side load when the crankcase is torqued. This tip will produce only very small gains but all small gains will add up to one big gain.